--It's convenient to go-anywhere with simply connecting it to an available iPhone/iPad and LAN network, easy to carry and use.Also with a adapter for lighting to USB camera reader and charging port. -- No need for external USB or power supply, connect iPad/iPhone Lightning to wired Lan Ethernet network via RJ45 port. It can still be used without electricity. It supports iPhone, iPad with lightning interface, you can also connect keyboard, camera, HUB, SD/TF card via USB port. It has powerful functionality to meet your requirements. 1. Turn off Wi-Fi on your iPad or iPhone. 2. 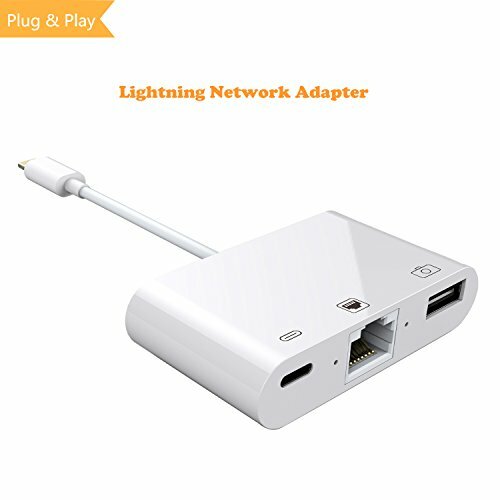 Insert your router-connected Ethernet cable into Ethernet port of our adapter, and connect the lightning end into your iPad or iPhone. 3. Go to"Setting" in your iPad or iPhone and the Ethernet settings will show up on your screen. 4. Click the "Ethernet" to obtain an IP address. 5. Open Safari and check if the connection is working. 1.Q: Why iPhone/iPad prompts "This accessory is not supported",when connecting the 3in1 adapter? A:-- Improper connection: Please pull out the 3in1 adapter and reinsert. -- The phone case is too thick: Please remove the phone case and insert it again. 2. make sure your router-connected Ethernet cable is connected to the internet. 3. This adapter cannot implement self-dial access. It requires your router device to provide IP through the DHCP service. 4. This adapter is not compatible with devices with systems lower than iOS10.0. Before using, please upgrade your system to iOS 10.0 or higher. The upgraded iPhone OTG adapter compatibles with iOS 10.0 or later compatibility Version,compatible with the latest iOS 11.3. Easy to use, plug and play, NO APP NEEDED. Connect the network card / network cable, iphone / ipad to achieve wired network access, solve the problem of WiFi instability, allowing you to watch video and play games more smoothly, get more enjoyable online experience. PLUG & PLAY: Simple operation, no need for any software, driver or power supply, three sockets can be used at the same time, charging can also go online and transfer files by your iPhone/iPad/iPod touch. If you have any questions about this product by Hkitty Xiong, contact us by completing and submitting the form below. If you are looking for a specif part number, please include it with your message.